"Have You been trying to find an Impartial Guide to all aspects of Log Cabins?" Log cabins are a fantastic and beautiful alternative to more conventional construction methods. They are completely unique, and their design, construction and maintenance is different to any other type of building, even timber frame. They are very appealing with lots of benefits, but their unique characteristics also mean you must understand some key issues. This is to ensure that you choose the right cabin in the first place and that you properly look after these wonderful and natural structures. 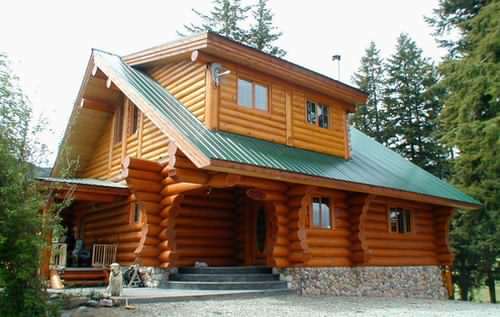 I am really passionate about log buildings as an ex-managing director of a quality log cabin company. I've found over the years that many people do not have all the vital information they need, to choose the right log building for their individual requirements. With 20 years experience of being around log structures and around 10 years of being in charge of a quality log company, it became apparent that there are several absolutely crucial aspects to the long term success and budget of your log project. Unfortunately most people find out about these facts too late, often after they've purchased their log cabin, or even later down the road when some issues become apparent! It is my sincere aim to provide you with some real critical facts, based on years of real hands-on experience, and not some clever marketing material that is designed to get a sale! For many people, building or buying a log cabin is a first time experience for them and therefore a huge, steep learning curve. There are many crucial things you must know before starting. We will go over all aspects of log buildings, section by section, so you can make up your own mind and relax in the knowledge that you know what to look out for. A log cabin is a major investment for most people. As is prudent with all major investments, please take the time to do your homework if you want the best results! I hope that by providing all the relevant information in one place, we can make this whole process as easy and stress free as possible. Taking the time to get the right information now could save you a lot of time and money in the long term! Log buildings are uniquely constructed and completely different to any other type of building, so ignorance will lead to problems sooner or later. I want you to understand all the various aspects of log structures, so you can fully enjoy the benefits and beauty of these wonderful types of buildings. They offer so much, so make sure you maximize the up sides and eliminate any potential down sides. With this in mind, I hope that by going over all these crucial areas in detail, that you will be able to answer the questions that all log cabin purchasers should really know. Can you answer all of these fundamental log questions below? How do I know if the timber quality is good? What type of logs should I use? How are the logs joined together? What log thickness is acceptable? What design features are the most important? What type of foundations should I use? Do I need insulation and if so where? What interior options have the biggest impact on cost? How do I make sure moisture does not create problems with the timber? What is log settlement and how do I deal with it? What should I treat the wood with and how often? What things should I be checking periodically on my cabin? These are just a few of the many questions you must know the answers to. If you are not confident in answering some of these questions, then I would highly recommend you educate yourself on these key areas and many other log facts. There are many different products out there and you need to make sure you get the right one for your needs. Glossy brochures can look very attractive, but the basic truth is the product itself must be right! By guiding you through all the information surrounding log cabins, you can be sure that when you choose yours, you have made the right decision! Having personally managed all aspects of log projects, from planning and design, to construction and maintenance, I want you to be armed with all the essential facts. Although the work I personally undertook was predominately based in the UK and Europe, I also worked with companies in North America. There are different types of log cabins in different parts of the world, but largely the principles behind them remain the same. So, please read on to discover everything you need to know about log buildings….. Your home is probably your single biggest investment and as a place where you will spend most of you time, it is hugely important! Find out what areas you should spend special attention to, and you can enjoy a beautiful living environment that few others in conventional homes can only dream of! There are more and more small log cabin kits on the market these days. We’ll cover the main types that are available and how to assess if they are really suitable for your requirements. You will need to find out about quality and you need to decide if you can construct it yourself or leave it to the experts. Being a particularly relaxing environment to live and blending into the rural environment make log cabins ideal for holidays. If you are thinking of building a single holiday chalet or doing a large log cabin holiday development, you need to know what to look out for. Also, you may want to try a cabin holiday first and would like to know where to find some good places to stay. Either way, you'll discover some great ideas in this section! Garden cabins have become extremely popular recently. Whether you want a little extra room for leisure activities, more living accommodation, or somewhere to work from, there are many options. Get some ideas and find out why garden cabins can be an easy answer to your need for more space! We all like a bit of luxury but quality is often more than skin deep. We'll take a look beyond the obvious to see how deep the quality runs and how to make sure you get real value for money. As with most things in life you tend to get what you pay for, but often all the small details can make a big overall difference to a luxurious cabin! The budget end of the market has seen huge growth and there are many cheaper cabins for more occasional use available. Discover if a cheap log cabin is what you really want... or would you be better spending a little more? While everyone has a budget, it's very important to remember to compare like for like and not get sucked in purely by the bottom line price. A crucial and sometimes much overlooked area of log cabins. Whilst naturally the visual appearance is very important, we reveal why certain design aspects are critical in the long term success of your log cabin. Should you consider doing this yourself or not? Constructing your log cabin correctly is imperative in order for it to stand the test of time. 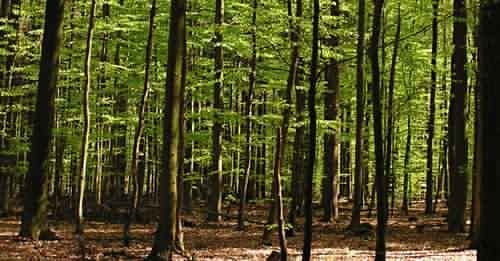 Wood is a natural material and will react to its prevailing weather conditions and environment. Find out what aspects you must pay a lot of attention to. Log Cabins in the UK have been a fairly recent phenomenon. Compared to Scandinavia where log cabins have been around for a log time, cabins in the UK have only really been seen within the last 20 years or so. We’ll explain some of the differences this location may make and what type of log cabins are most popular. Log buildings have a long history in this part of the world and there are good reasons why so many good quality cabins come from here. Discover why this area has so many log manufacturers and see what some of the differences are in Scandinavia. In North America they do have similar log cabins to Europe, but they also have some which are quite fundamentally different. The more rustic whole log type of cabins are popular there, and whilst they are extremely impressive in many cases, you should be aware of certain issues that will need careful consideration if you decide to go down this road. Working from home is a trend which is set to increase, with frustrating commutes worsening and online communication improving. A log office provides a great working environment, providing a sense of calm in a stressful world. In this section, we'll take a look at the sort of things you will need to provide a suitable and efficient work space. Another growing trend in recent years is mobile log units. These are particularly popular on holiday parks and can come literally fully functioning and ready to use. Being mobile also has certain planning advantages in some countries, although this may restrict the size of unit you can get. Find out more about mobile unit in this section. There are hundreds of log manufacturers from dozens of countries. Do you know who is good and what their products are really like? Well, the manufacturers' location globally may well give you some good clues, but do you know exactly where your log are coming from? Learn more about log manufacturers…. There are 2 areas to investigate here. Firstly, most people will be concerned about buying a new cabin so we will look into this in more detail. Secondly, there may be some of you who are interested in purchasing a second hand log cabin to either use as it is, or maybe with a view to disassembling and constructing it again. If this is the case please find out how feasible this really is. There are many different types of timber out there which are used to make logs. The quality of timber varies considerably and you need to know if this matters for the type of usage you are planning to have. We will reveal how even a complete novice can get a good idea of what the quality of the timber is like. Should you choose round or square logs? What thickness do you need? Do you need planed or laminated logs? What methods are used to join the logs? These are just some of the very important questions you'll find answers to in this section, in order to choose the right log cabin. 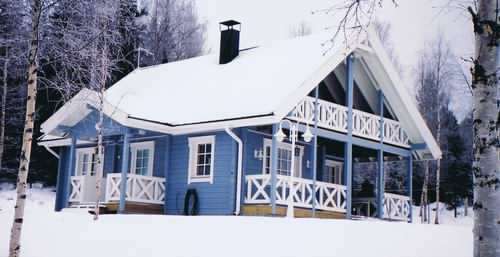 Log buildings are very thermally efficient, but will you need insulation or not? Look into what you will need and the various different areas that can be insulated. Also find out about different types of insulation and how this may affect the budget. You will spend most of your time inside your log home, so you must get this right. Some people love all timber, while others like more conventional interior finishes. And some like to mix it up a bit! Your choice here can significantly affect your overall budget and you must be aware of any fire treatments which may be required, as these are very expensive. The windows and doors used on your log cabin are very important components of the building. Not only we you look at them and use them all the time, but their performance will affect your comfort, running costs and security. You will need to understand the differences that you will find and discover how to choose the right ones! Need some planning permission guidance? For some countries, like the UK, this is a critical aspect of the viability of your log cabin project. Building regulations or code will also vary according to your location. You need to find out about requirements early on, so that you don't get any nasty surprises further down the line! What are the different types and how do the costs vary? There are a lot of ways to do foundations and you need a suitable design. Find out about some of the fundamental principles and how to make sure you cabin stays properly supported over the years. A good paint is essential to look after your investment in the long term. Make sure you choose and apply the wood stain correctly and repaint at sensible intervals. Other maintenance is also crucial, and with a little time and care you can protect the integrity of your log structure indefinitely. There are many reasons why you should live in or have a log cabin for a variety of uses. In this section we will explore why log houses are good for your health. They are also extremely good for the environment and if you want to improve your carbon footprint, then find out how you can do this. There are other sources of information out there which may help you with your log cabin project. Here we give you some other places to take a look at. Don't know where to find a page? Here we list all our pages in order by section, so you can navigate easily around this site. The site map has links to each page, so simply click on them to go direct to any page. Who am I? What is my story? Find out here how I came to love log cabin and run a company, designing, supplying, building and advising on all aspects of log cabins. We want a complete log cabin resource, that answers every single log cabin question you can think of! Our simple survey gives us feedback and allows you to ask for detailed information, so we can ensure this happens. Do you know what a blog is? Well, a blog is a bite-sized journal which keeps you up to date with all the latest things happening on this site. Why not subscribe to our blog and you can immediately find out about any changes and additions we have made. Blogs are very useful for letting you know about information which could be extremely useful to you. Would you like to get regular articles on log cabins? Our e-zine will be full of interesting log cabin facts and advice. We will also let you know the breaking news and keep you up to date with everything happening on this site. If you are really serious about doing your log cabin properly, then this is a must read! 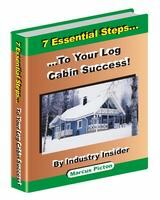 Packed full of practical log cabin information, the book covers the 7 essential steps to your log cabin success. With loads of pictures and diagrams our ebook really will guide you through all aspects from choosing, designing, building and maintaining your log cabin!